The eye makeup remover I'm currently using is suited for waterproof eye makeup and contains oil. It promises to moisturise the eye area and to provide the lashes with extra care. The coconut oil I'm having is extra virgin, 100% raw and organic. Yesterday evening I used the conventional eye makeup remover on one eye and the coconut oil on the other eye. I started off with the coconut oil which may needed to be liquified before using. I put a small amount on a cotton pad and proceeded as usual. I noticed that the removing process was a little more gentle than usually and the oil felt really good on my skin. It perfectly and easily removed my eye makeup and left an oily film on my skin. There were almost no mascara leftovers in or around my eyes. The other morning I noticed, that the lashes on the coconut oil side were more smooth and felt cleaner. My eye wasn't as swollen on that side and when I took a shower there were fewer mascara leftovers showing up. On my other eye I used the Balea eye makeup remover which wasn't quite as gentle (I've been having irritation problems with that one before). As always there were quite a few mascara crumbles ending up in my eye but the eye makeup seemed to be perfectly removed as well. The eye area looked quite moisturised but in the morning I couldn't feel or see a difference between both sides. As you can guess from what I said above the lashes on the eye makeup remover side still felt a bit sticky and didn't look as healthy as on the other side. Furthermore there were a little more mascara leftovers showing up after have washed my face. On the cotton pads it may look like the conventional eye makeup remover took off more makeup but it's simply more concentrated on the other pad. In conclusion I can tell you that both the eye makeup remover and the coconut oil did a great job when it comes to removing my mascara and eyeshadow even though the coconut oil was slightly more gentle and effective. 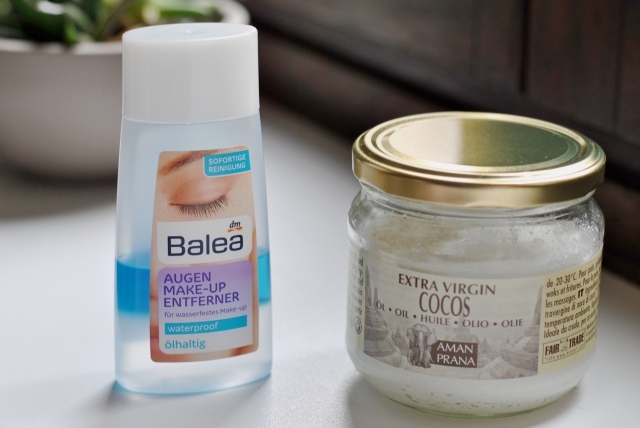 What really convinced me is the care it provided to my eyelashes so I'm seriously considering not buying another eye makeup remover but sticking to a coconut remover more regularly. Have you guys been able to try coconut oil as a makeup remover? Which other beauty products do you regularly switch for household remedies? Can you think of another interesting beauty battle I should make next? P.S. : On Twitter I started a water drinking challenge which is based on this article. The article may or may not be a fake but I definitely want to try it for myself. That's why I took a picture of my skin this morning and also took my body measurements and weight. If you want to enter you can do so with the hashtag #CCWaterChallenge and keep us updated on your experiences and progress. I've heard so much stuff about coconut oil but I feel like I'm the only one that doesn't like the smell so I don't like using it. I also don't like that the majority of time it's a solid where I live so it feels like such a hassle to us :( I do however us extra virgin olive oil to remove my make up which works like a charm! I think olive oil is a great alternative for most things coconut oil can be used for, especially if it works for you! One of my friends showed me a book (but I don't remember the title) where it's explained all the way to use coconut oil. From the kitchen to the bathroom! It's really a versatile product! I love these beauty battles Carmen! Great idea! I need to buy some coconut oil! Right now I'm using Mally Beauty makeup remover and it works great with no sting. I love removing my make up with coconut oil! But only when I really go to bed after that, because sometimes I get oily residue in my eyes. Hi Carmen, I had no idea you could use coconut oil as a makeup remover, thanks so much for sharing this, I will definitely be using it from now on as I find drugstore makeup removers too harsh. Thanks so much for your kind visit. Have a wonderful warm weekend! 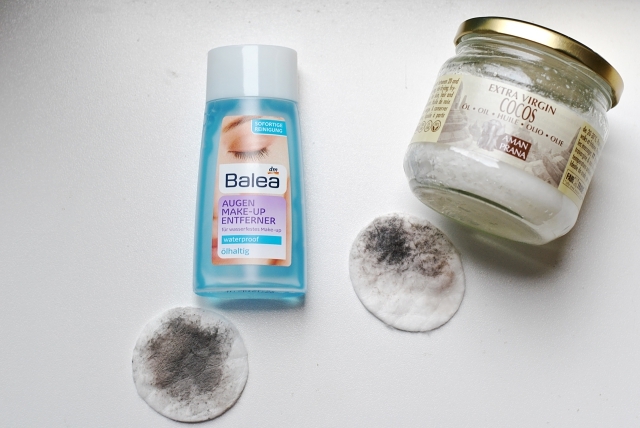 Interesting to read this post now that I have run out of eye make up remover. I would love to give coconut oil a try! I love coconut oil as hair oil :) The smell is so great and the hair feels sooo good. I still have 2 bottles of the Balea Eye MakeUp Remover with oil open (one at home, one at my boyfriends home) but i'm going to give coconut oil a try when they are empty. Your description sounds really good and at least we can save plastic. :) I like it.